Among the LRT projects, the Waterfront line is particularly important both as a new connection into the core from the east and the west, and because it supports new commercial and residential development in a very large area that has already started to build out into a transit desert by comparison with the rest of the core area. The major issue remaining (other than actually funding and building the project) was the nature of the connection to Union Station. This has now been settled as I detailed in a recent article. The plan is to retain streetcars in the Bay Street tunnel, but with reconstruction and expansion of Union Loop to increase its capacity. This station handles heavy demands for day-to-day commuting, but even more riders attempt to use it during special events along the waterfront. The projected future demand is much higher than the loop handles, with great difficulty, today. Leaving it “as is” is not a viable option. Currently, approximately 1,000 passengers use the existing streetcar service southbound between Union Station and Queens Quay in the AM Peak Hour and up to 1500 passengers use the system northbound in the AM Peak Hour. Additionally, thousands of walk trips are made along Bay Street and in the PATH network between Union Station and destinations in the Queens Quay and Bay Street area. During special events at Exhibition Place or in the Central Waterfront, transit demand at the existing Union streetcar loop is even greater, exceeding weekday peak volumes. For example, during the Canadian National Exhibition, hourly volumes approach 2,000 on the 509 Harbourfront streetcar. Queues for streetcar service during these events routinely extend into the Union Station concourse level. To put this in context, the existing 504 King service peaks at about 3,000 per hour eastbound at Bathurst Street in the morning rush. A volume of 8,000 per hour is roughly the same level as the Bloor-Danforth streetcar service just before the subway opened in 1966. Whether development and demand ever reach this level remains to be seen, and there is considerable leeway in that estimate. Nonetheless, the waterfront service will be among the heaviest transit links in Toronto, and the Bay Street tunnel is critical in getting riders through the very congested area south of the traditional downtown core. The western terminus will be at a new loop near the proposed Park Lawn GO Station at the “Mr. Christie’s” site. Operation west of Park Lawn will remain a streetcar line with some selective upgrades along Lake Shore Boulevard. The Humber River crossing will remain where it is on The Queensway. The route will dodge south to Lake Shore at Colborne Lodge Drive using the eastern half (northbound) of the existing road underpass, and will run east to Dufferin through a reconfigured park and road layout. A new connection (already in the design stage, see below) will link the existing streetcar system from Dufferin Loop to Exhibition Loop. 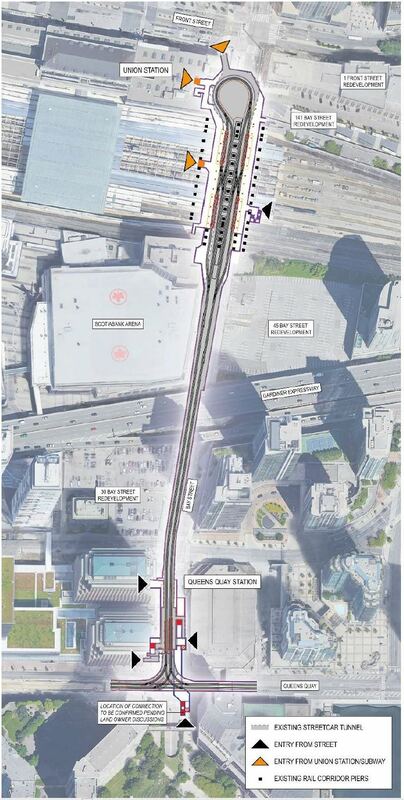 Queens Quay East will be redesigned in a manner similar to the area between Bay and Spadina. An interim terminal loop would be built at Small Street west of Parliament. Cherry Street will be realigned south of the rail corridor, and New Cherry will become the main north-south link into the Port Lands. A new span will be opened under the rail corridor for the streetcar/LRT tracks to continue on the east side of Cherry as they already do in the Distillery District. Queens Quay will be extended east across Parliament Slip to connect with the new Cherry Street. As part of the transit plan for the East Harbour development (former Lever site), Broadview will be extended south to Commissioners so that a streetcar service can operate south to East Harbour and thence westward to Union Station. Track on Commissioners will extend east to Leslie Street providing a second access route to Leslie Barns. The revised stations at Union and Queens Quay present construction challenges and the link could be closed for up to five years. The City is considering a staging plan that could see an east-west link on Queens Quay open first so that the loss of streetcar service to the waterfront is for as short a time as possible. Other factors that will affect the timing of various components include the Gardiner Expressway reconstruction and realignment from Jarvis to the Don River, SmartTrack, the Relief Line and other works at East Harbour. At the Exhibition grounds, design work is underway for a link between the existing Exhibition Loop (just east of the GO station) and Dufferin Loop. As an interim step before construction of the LRT extension to Humber via Lake Shore, this would allow service from King Street West (and hence either The Queensway or Roncesvalles) to enter downtown via the waterfront rather than along King. It is not clear how much of a time saving this would actually provide considering the benefits of the King Street “Pilot” which is about to become permanent, especially during any period when the Bay Street tunnel is closed for reconstruction. Service on King from Dufferin to The Queensway would still be subject to congestion problems, notably at Jameson and especially at The Queensway. Design work on the eastern leg of the waterfront line is already past the 30% mark. With the decision to retain streetcars in the Bay Street tunnel, that portion of the project could move ahead to 30% design and a Class 3 cost estimate for at least the first stage of the Queens Quay East project. However, this project is not funded despite being among the City’s top transit priorities because of the growth already underway and planned for the eastern waterfront. The western extension of the Eglinton/Crosstown LRT re-emerged from the wreckage of John Tory’s SmartTrack proposal for this part of the city. In SmartTrack, a line would have branched off of the GO Weston corridor at Mount Dennis and headed west along lands north of Eglinton Avenue that had been reserved for the Richview Expressway. This scheme failed on several counts including the fact that some of the corridor had been sold by the city for development and there were houses where Tory (or more accurately Tory’s ill-informed consultants) would have put trains. Another problem was the near impossibility of making both the turn and the grade change from the rail corridor to Eglinton without doing severe damage to existing residential neighbourhoods enroute. 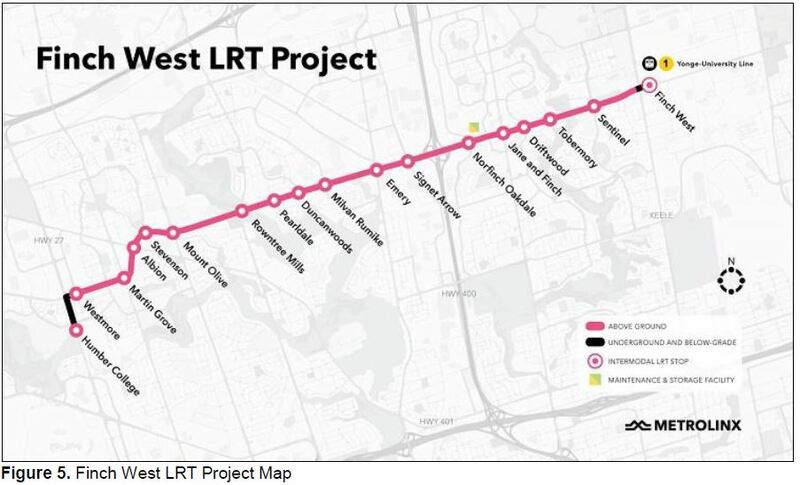 The fallback position was to embrace the original LRT scheme, although it is still referred to in some documents as if it is somehow a part of SmartTrack. Although the City did sell off some of the expressway land, they reserved enough to allow for widening Eglinton Avenue to the north to make room for an LRT right-of-way in the centre of the road. The biggest controversy over the proposed LRT line is its effect at intersections, specifically for turning moves. The line passes through central Etobicoke, definitely Ford country, and a strong contingent wishes to see it buried in part or whole. The City did nobody any favours with the original intersection designs that require a “Michigan left” for turns off of Eglinton. This would require vehicles to make a right turn onto a cross street, then a U turn to wind up facing the desired direction. The geometric requirements of this for large trucks, not to mention the additional lane weaves needed, killed the credibility of the scheme and needlessly undermined the surface LRT proposal. The designs have reverted to standard left turns across the LRT right-of-way, but the damage was already done. Doug Ford is now Premier, but this extension is not at the top of his priority list. Comments from the team advising the government claimed that the City of Toronto had not given an underground option serious consideration when in fact various grade-separated schemes were reviewed (see below). If this is a case of an “advisor” parroting a standard political mantra without checking the facts, that is troubling for the success of good-faith negotiations with the city. The advisor has retracted his original comment, but has created a credibility problem that must be overcome in future talks. The Toronto Segment runs west from Mount Dennis to Renforth Gateway. This was the subject of recent reviews. In most cases, the line crosses above the Humber River on a bridge, but the all-underground scheme goes under the river. The Airport Segment runs north from Renforth Gateway to Pearson Airport, presumably to a transportation hub proposed by the airport authority. The design shown for this segment is a preliminary version by Metrolinx, and much of it is grade separated. No funding is in place for either segment, and of course the cost will depend on the degree of grade-separation chosen. Toronto will not contribute to the line’s cost outside of the city, and it is unclear how the Airport Segment will be funded. There are four concepts for the Toronto Segment as described in Attachment 5 [p. 5]. Option 1: 10-stop surface-running concept as recommended to City Council in both July 2016 based on the findings of the Initial Business Case (“IBC”) jointly prepared by the City and Metrolinx, and in December 2017 based on a further review of targeted grade separations to alleviate perceived traffic impacts. In this scheme, the Toronto Segment is on the surface from the Humber River westward. 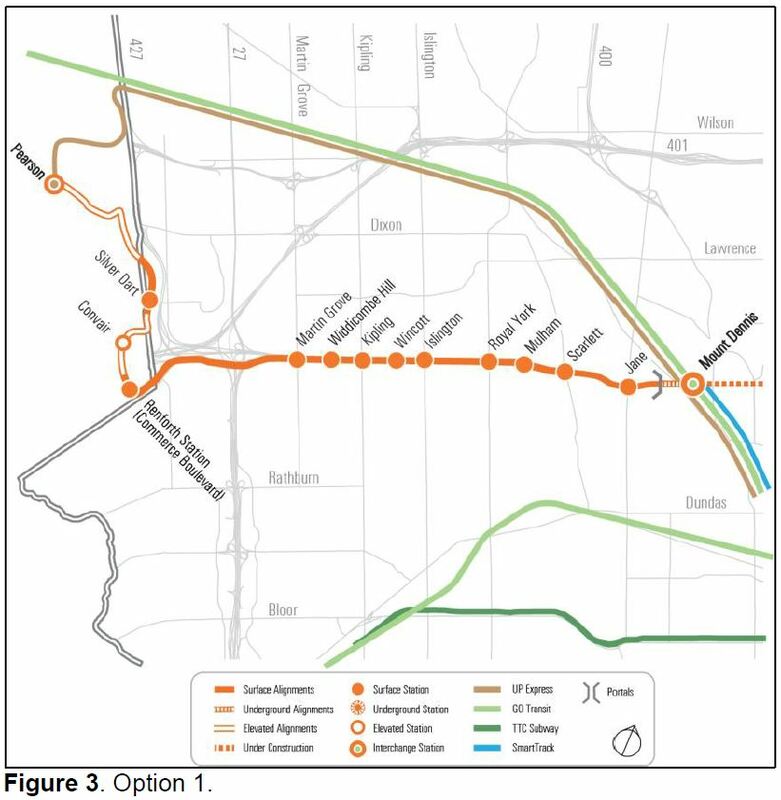 Option 2: 10-stop underground concept, developed in response to both the need to provide transit connectivity to the community, and a strong community desire to construct the EWLRT underground. In this version, almost all of the Toronto segment is underground including at the Humber River, except for the approach to Renforth Station. The stations are the same as for the surface option. Option 3: 3-stop elevated and underground concept, previously considered in the July 2016 Initial Business Case jointly authored by the City and Metrolinx, with parallel bus route. In this version, the line is effectively an express route across Etobicoke stopping only at Jane, Kipling and Renforth Gateway. The portion from the river to west of Scarlett Road would be elevated, and the line would then dip into a tunnel to just east of Renforth Gateway. 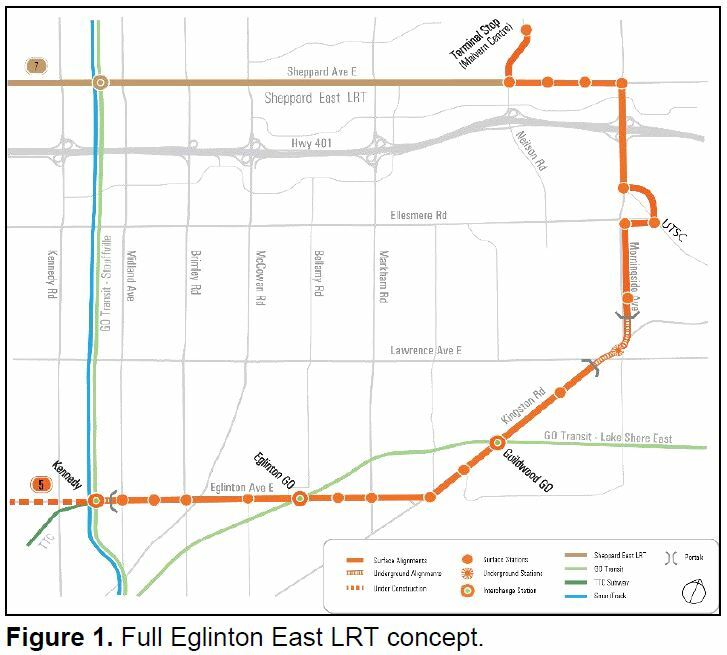 This is an option designed around regional travel and it assumes most who would link to the Eglinton corridor would do so as a bus-to-bus transfer. Another obvious effect is that with few stations, there is little opportunity or pressure for Transit Oriented Development (TOD). Option 4: 7-stop elevated and underground concept, developed by the Community Working Group, with parallel bus route. This is a variation on Option 3 with stations added at Martin Grove, Islington, Royal York and Scarlett Road. Options 2 through 4 are underground with varying numbers of stations, and cost estimates for them reflect this. The cheapest of all is Option 1 which is almost all at grade. All of the underground options assume tunneled construction as on the main Crosstown route. This could contribute to the cost estimates for the underground options, especially at stations depending on the assumed tunnel design (twin bore with large box stations versus single bore with stations stacked inside of the tunnel). 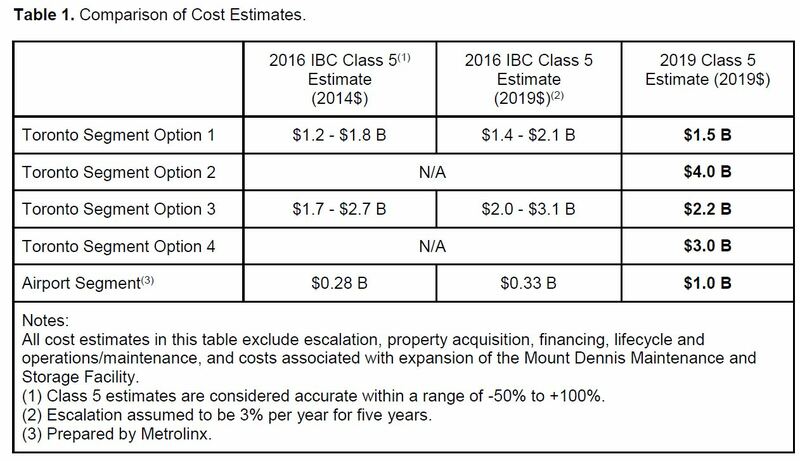 The estimate shown here for Option 1 has been updated with a Class 4 value of $1.8 billion [Table 2, p. 15]. There is no comparable class 4 estimate for the underground options. The Toronto Segment is not ready to progress beyond this preliminary level because Metrolinx is considering the regional effect of a surface or grade-separated extension and its stations as an access to Pearson Airport. No information on Metrolinx’ analysis or preference is available. Planning and conceptual design for the Airport Segment from Renforth Station to the proposed Regional Transportation Passenger Centre (“RTPC”) at Pearson International Airport is being led by Metrolinx with support from City and TTC staff. The Airport Segment concept has not significantly developed from the alignment contemplated in the project’s 2010 Environmental Project Report because the RTPC concept, being advanced by the GTAA, has not advanced to a point where the terminus of the Airport Segment can be identified with any certainty. As a result, the Airport Segment of the overall EWLRT extension is further behind the Toronto Segment in the project lifecycle. Ridership projections vary for the four options. The table below applies to the Toronto Segment, and the travel times are end-to-end from Renforth Gateway to Mount Dennis. After a review, options 2 and 3 were rejected. 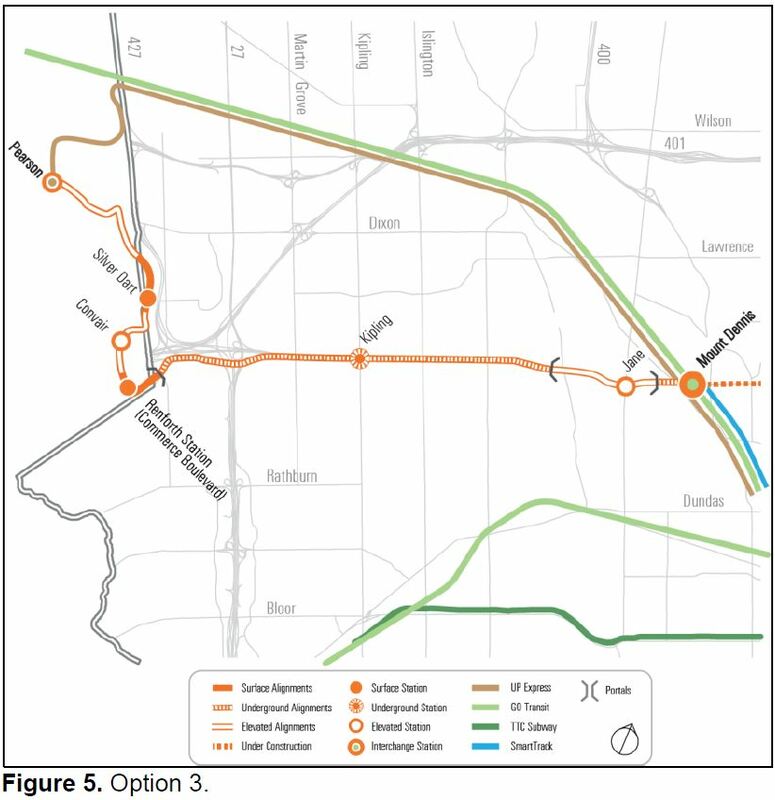 Compared to Option, 1, Option 2 would have a longer construction period with resultant impacts to traffic and adjacent communities, risks associated with construction under the Humber River and ongoing risk of flooding to the tunnel. This option is also has much higher capital, lifecycle and annual operating costs than Option 1. Option 2 would also have more property impacts than Option 1 to facilitate tunnel boring machine (“TBM”) launch and extraction sites, as well as station construction sites and entrances. Option 3 would have more property impacts than Option 1 but fewer than Option 2, to facilitate TBM launch and extraction sites, as well as station construction sites and entrances. This leaves Options 1 and 4 on the table, and the city prefers Option 1. Option 4 would have more property impacts than Option 1 (but fewer than Option 2) to facilitate TBM launch and extraction sites, as well as station construction sites and entrances. There was strong public support for the various underground options during public consultations, and this will be difficult to overcome especially by comparison to Scarborough where the subway option for the Line 2 extension won out over an LRT network. The review of Options 1 and 4 [see p. 14] attempts to thread a path between the two views, but at the end comes down to perceived value versus impacts. 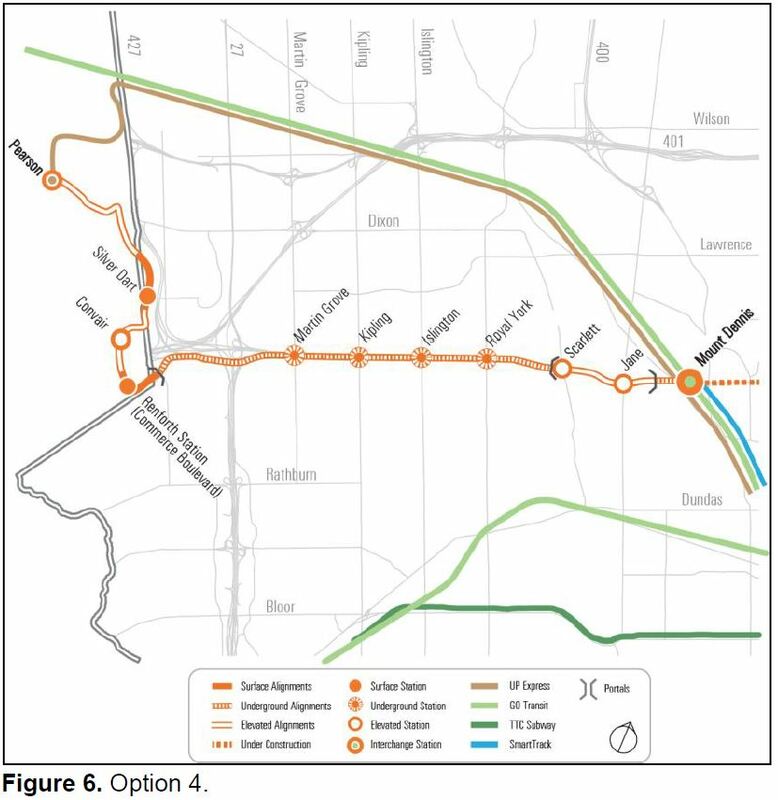 Option 4 offers a good, pragmatic balance between connectivity and speed of the LRT with economic benefits that exceed those of Option 1. Nonetheless, it does not meet all of the City and TTC’s policy objectives for transit connectivity and would require the TTC to maintain the operation of the Eglinton West bus service. The study argues that the addition of a surface LRT line would not in itself worsen congestion that arises from a poor existing design and the pressure of future traffic growth. The Eglinton Avenue West corridor is unique in Toronto because it was originally planned to accommodate the Richview Expressway, which was cancelled in 1971. The right-of-way is over 100 metres wide in places, and is characterized by very wide boulevards between the street and private properties. The Highway 401-Highway 427-Highway 27-Eglinton Avenue interchange at the western end of the EWLRT corridor was also originally designed to direct traffic to the planned Richview Expressway. Because the Expressway was never built, seven lanes of traffic exit the highway interchange and are required to stop at an urban stoplight at Eglinton Avenue and Martin Grove Road. As a result, the Eglinton-Martin Grove intersection is one of the city’s most congested intersections. Operational issues spill over to intersections along the Eglinton corridor including Kipling Avenue and Islington Avenue. 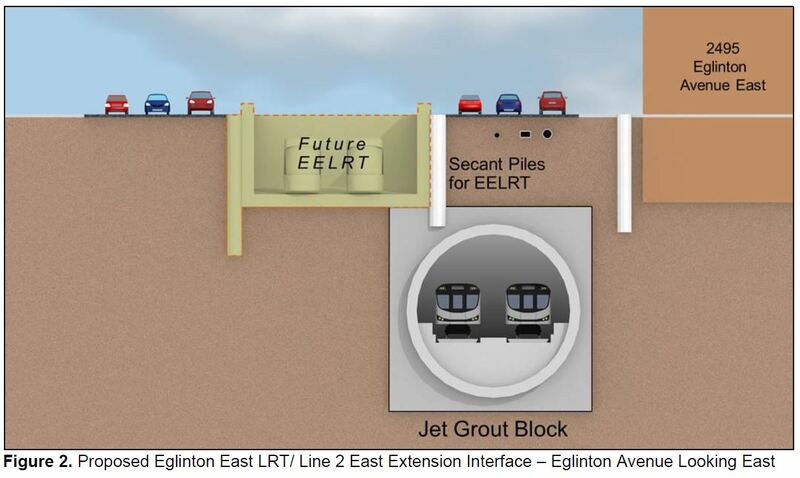 Extensive simulation modelling suggests that the traffic network in the area around the potential EWLRT corridor is saturated during peak hours today, and estimates that travel time in the Eglinton West corridor between Renforth Station and Mt. Dennis Station will approximately double by 2041. Although the city prefers Option 1, I would not be surprised to see Option 4 win out if the province comes to the table with substantial funding. In either case, the City and Ministry of Transportation must address the road configuration and capacity, and any LRT construction will have to thread through the revised design and construction. The Eglinton East LRT is the victim of the financial shell game played at Council with money for the Scarborough subway. 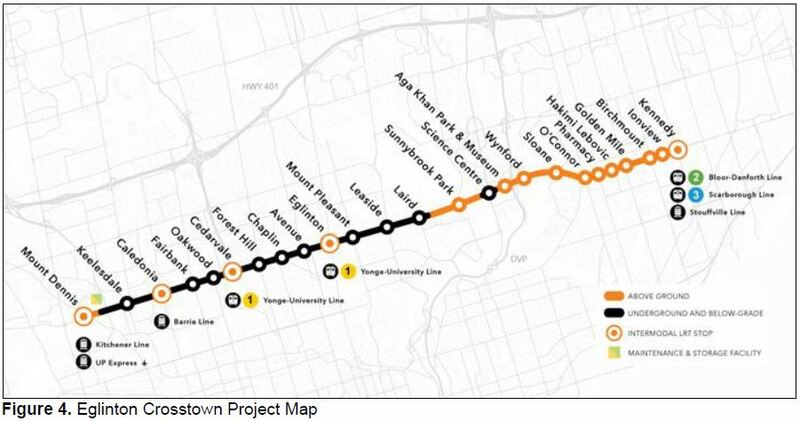 Although the LRT was supposedly funded at least to University of Toronto Scarborough campus, that money would be needed to build the subway extension. The Star’s Jennifer Pagliaro has covered that bait-and-switch scam in detail. There was a time in 2018 when the idea that federal money through the Public Transit Infrastructure Fund (PTIF) would be available for this line. But, no, the PTIF money is now earmarked for the subway extension, the Relief Line, Bloor-Yonge Station expansion and SmartTrack. Planning continues regardless, although at some point all governments will have do decide whether we are just wasting our time on this and other unfunded transit projects. Transit debates about LRT vs buses often go down the path of saying “let’s just run buses”, but this can be challenging. 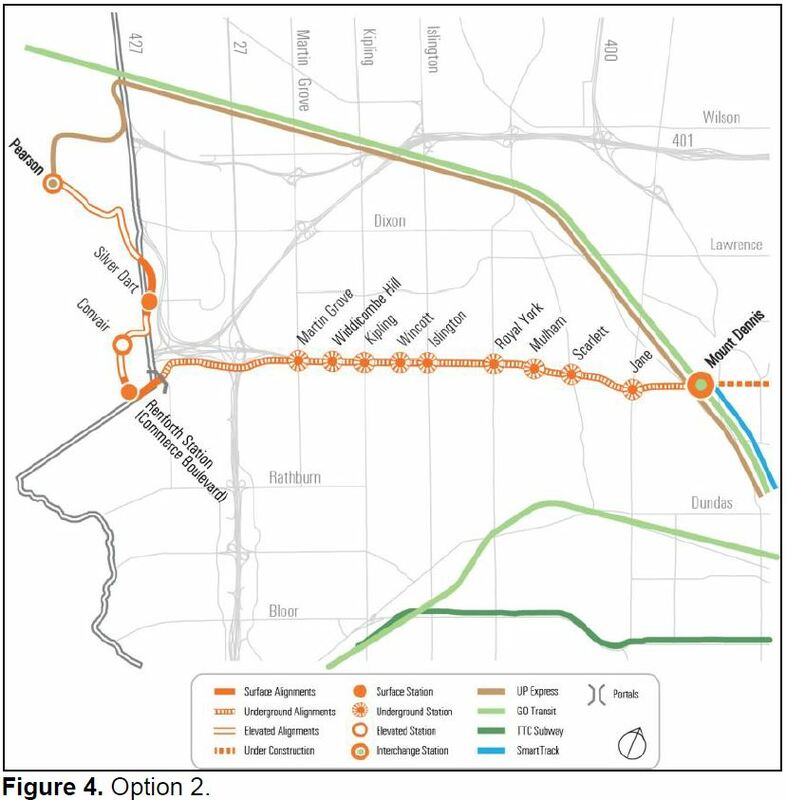 The EELRT would provide approximately the same transit travel time between points along the corridor as the future Business as Usual (“BAU”) scenario where the existing bus services are maintained and grown to meet demand. In all cases, the frequency of the LRT service is less than bus frequency in the BAU scenario, but the LRT would improve transit reliability, crowding, amenity, and would provide higher capacity. For reference, the peak service on King Street today provides for about 3,000 riders/hour maximum. Eglinton East would need 50% more. The full line would run from the underground Crosstown station at Kennedy surfacing west of Midland Avenue, then east via Eglinton and Kingston Road. A short tunnel section would take the line under Lawrence East and a short way up Morningside. From there, the route continues north with a jog through the UTSC campus to Sheppard, then west and North via Neilson to Malvern Centre. From a staging point of view, the section north of UTSC is considered to be “Phase 2”. Because the extended Crosstown would be close to the proposed Scarborough Subway extension, work on the subway will include provision of piles to provide stability for future work without disturbing the subway tunnel. From Kennedy Station to the proposed underground station at Kingston Road, Morningside and Lawrence East. From Kennedy Station to UTSC. The challenge for these options is that vehicles must be stored and serviced somewhere. If the line ends at Kingston Road (option 1), then additional storage will be needed at Mount Dennis, but the available expansion space there is intended for the Eglinton West extension’s cars. If the line ends at Malvern Centre (option 3), there remains the question of the Sheppard East LRT’s status together with the proposed carhouse at Conlins Road (below). Option 3 also requires co-ordination with plans by the Ministry of Transportation for reconstruction of the Morningside-401 interchange. 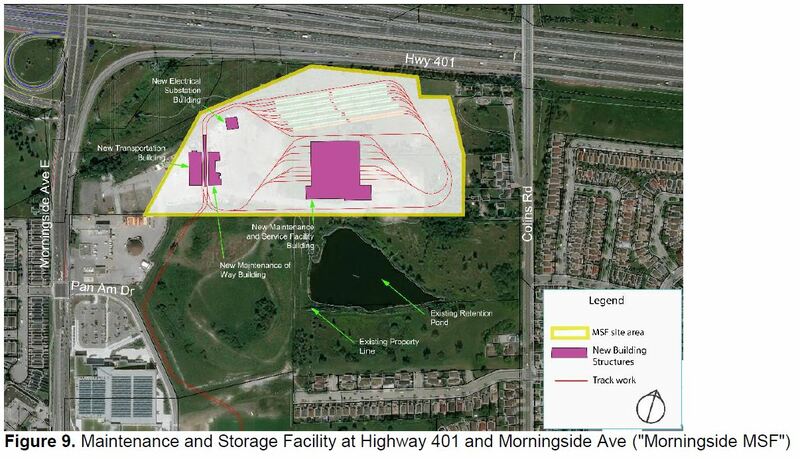 As an alternative, a maintenance facility could be built south of Highway 401 only a short distance north of UTSC. 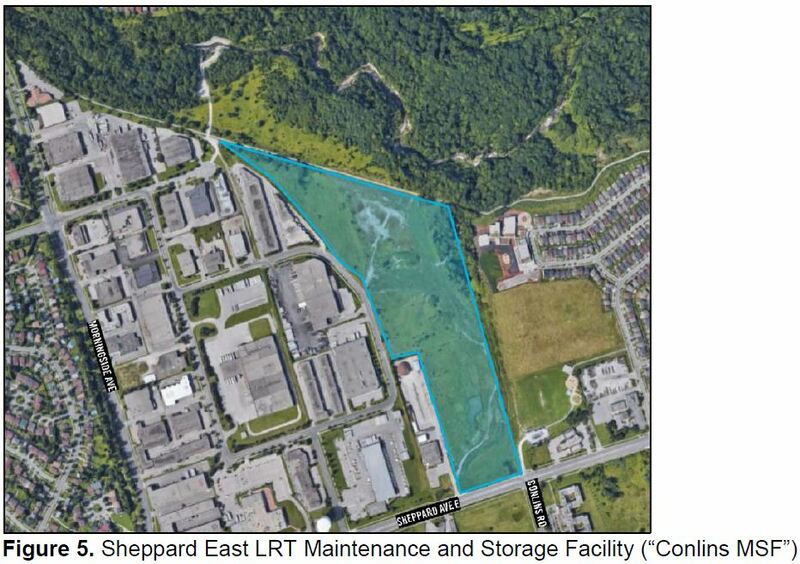 This could be part of option 2, and the facility would replace the one originally proposed at Conlins Road, including for the Sheppard East LRT if it is ever built. The cost estimate for various options is shown below. Note that the options add on each other so that the marginal cost of going to Malvern with option 3 is $0.4 billion compared with stopping at UTSC under option 2 which is the recommended one. The cost of the maintenance facility, wherever it might be built, is not included below. Option 2 is the recommended one. The extension beyond Highway 401 to Malvern would be treated as a second phase depending on both construction plans for the highway and the future of the Sheppard LRT proposal. The Eglinton Crosstown LRT is under construction by Metrolinx who will own the line. The tunnel between Black Creek and Brentcliffe was physically complete in mid-2016, although much additional work is needed to add the tunnel floor, track and the many systems that comprise an underground railway. This work is ongoing. Construction of the eastern surface section is underway and at various stages between Brentcliffe Portal (between Laird and Sunnybrook Park stations) and Kennedy. Underground segments at Don Mills (Science Centre Station) and at Kennedy are cut-and-cover projects. A small amount of track has appeared on the line east of Victoria Park, but Eglinton Avenue itself is a mess of overlapping construction work for utility relocations, road widening and creation of the LRT right-of-way. For detailed information on work along the corridor, see the Crosstown Construction Updates page. At Mount Dennis, the maintenance building was substantially complete in fall 2018, and Metrolinx hopes to have track installed east to Keele (Keelesdale Station) for vehicle testing later in 2019. Vehicle deliveries from Bombardier are badly behind schedule. The consortium of SNC-Lavalin, EllisDon, AECON, and ACS Infrastructure Canada was contracted by Metrolinx to build the Crosstown, and it is known as Crosslinx Transit Solutions (CTS). There is a lot of gray area in this split of responsibility especially as it relates to maintenance and where the distinction between “regular” and “lifecycle” might lie. The TTC and Metrolinx are working to finalize an operating agreement before revenue service begins in September 2021. The Finch West LRT project is much earlier in its construction cycle than the Crosstown and is still at the stage of soils testing and utility relocations along the route. Preliminary work on the maintenance facility begins this month (April 2019) and at some other locations. This route includes two short underground portions: one is at Finch West Station where the line drops below grade to connect with the existing station on Line 1 at Keele Street; the other is at Humber College. This line will operate with Alstom vehicles, a first for Toronto, thanks to Bombardier’s repeated failure to meet delivery targets for the Crosstown project. Substantial completion is planned in 2023. For detailed updates, visit the project website. The Omnibus report is completely silent on the Sheppard East project, and its status could charitably be described as “on life support” thanks to constant political pressure for a subway linking Don Mills Station to the extended Line 2 at Scarborough Town Centre. Recent correspondence from the team negotiating the “subway upload” to the province does not mention Sheppard, although it is clear that restoring the 3-stop Scarborough extension option will take Line 2 to up to Sheppard. This link was part of Mayor Rob Ford’s original subways-subways-subways plan, and it is sure to reappear if only as part of a wish list by subway backers. The future of any Sheppard East service, be it subway or LRT, is unlikely to be resolved in the current terms of Toronto Council or the Ford government at Queen’s Park. This entry was posted in A Grand Plan, Eglinton LRT, Finance, Finch West LRT, Scarborough-Malvern LRT, Sheppard East LRT, Waterfront. Bookmark the permalink. I assume that CNE management has already agreed to the property losses and building teardowns [not much, I admit, but it is a bit of an empire] that will result from the streetcar expansion to Dufferin. When did this happen? Somehow, I missed it. Steve: The Dufferin link runs along the north side of the Exhibition grounds under the Gardiner Expressway. The current work is an outgrowth of a decision in 2015 to review the waterfront transit network, and the link to Dufferin has been part of that plan for even longer. I hope that the Ford government will bury all of the Eglinton LRT in Scarborough starting from Victoria Park and no matter how much it costs or how long it takes because it is time to right the wrongs of the Liberals. Steve: Considering that the work to build this is already underway, and changing the design would delay this project for years, I doubt it. As for righting wrongs, the list of things that will have to be fixed when Ford is deposed grows longer by the day. My worry is that whoever takes over, like McGuinty after Harris, will never get around to undoing Ford’s damage. As usual, thanks for explaining what is going on (or, more likely, what is being talked about!) Not to complicate things but, would it not be good to look at transit to/from Ontario Place? As has been discussed at length elsewhere, it is currently in a ‘transit desert’ and any of the many (and conflicting) plans currently being discussed hope to attract far more people to the area. Steve: The problem is that Ontario Place has not been considered as a major transit destination ever since the original option of routing cars down there from the Eastern Gate was nixed by Ontario Place itself decades ago. The shift of the streetcar loop north under the Gardiner to make way for the trade centre building reinforced the problem. The essential issue is that Exhibition Place is not part of the commuting origin-destination pattern, and even without its heavy car-oriented layout, would not be top of anyone’s list for a major transit investment. I suspect that the 121 bus is all we will see for quite some time. Doesn’t “under the Gardner” become a bit dicey at the west end of the ‘Ex’? Steve: Yes, the line would veer away from the Gardiner, but the land immediately to the south is mainly parking. If the track is extended to Dufferin as an interim upgrade, would the TTC also extend the 509 to the loop and cause congestion with the 504 there? Steve: There has been no discussion about service design, although it is possible the 509 would be extended ever further than Dufferin Loop to add service on King West. Early days yet on this project which is still unfunded. The Gardiner is below grade by the time it reaches Dufferin, so route can no longer be under it. According to this 2008 report. What’s not clear to me is how the streetcars will cross the entrance to the GO station. Steve: Yes. The streetcar line would have to swing south and run parallel to the Gardiner. There is not much in the way. Passengers headed to the GO tracks would go under the streetcar extension. 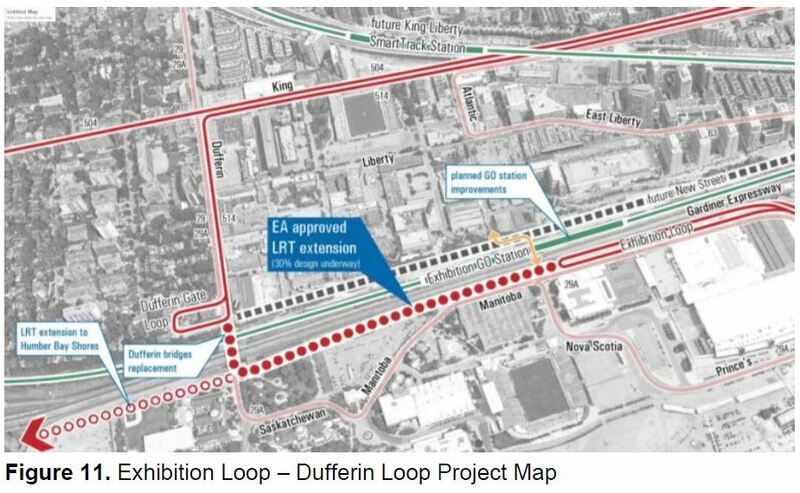 The connection from Exhibition loop west to Dufferin is definitely doable. Up to Yukon Place it’s all surface parking, except they might need to trim the park just east of Dufferin a bit. The Dufferin bridge would likely need rebuilding but it needs it now anyway. If there are alignment problems to speak of, they might be further west around the Legion and the sailing club south of Dowling Avenue – that bit is legitimately fairly tight right now and a building might need to be taken. For Eglinton West, it is a bit surprising that fully grade-separated Option 4 is only two times more expensive than fully at-grade Option 1. Usually, a ratio of 3 to 4 is expected in such cases. The quality of those estimates is relevant to the choice between 1 and 4. Furthermore, it would be interesting to look at an option that combines elements of 1 and 4. Underground stations at Martin Grove and Kipling only, where the impact of congestion is greatest; a short tunnel can probably be built using cut-n-cover. Islington would be either at-grade or elevated (the geometry of the Eglinton / Islington intersection makes an elevated station there relatively cheap). Royal York, Scarlett, and Jane could be at grade. One would expect EELRT to be 10-15% faster than the bus, since a) the bus is affected by traffic congestion, and b) the bus stops more frequently. If the said statement is correct, then perhaps the number of LRT stops between Kennedy and Kingston Rd should be reduced. TTC prefers not to run parallel bus service; but in this corridor, some bus operation might be retained anyway. Currently, the corridor is served by 3 branches of #86 and 3 branches of #116. While #116B and 86C are just short-turns, #116A, 116C, 86A, and 86D all serve their exclusive areas at the outer end. Some of those lines can be re-routed via Lawrence or Ellesmere, or terminated at an LRT stop, but it is unlikely that none of them will continue running to Kennedy Stn. If so, then cutting some of the LRT stops should be less of a problem. The Dufferin Link: ‘Approved’ in 1993, ‘planned’ in 2008, really-seriously reviewed in 2015, and unfunded in 2019. All this in an attempt to lay the first stage [1 lousy K] of a much larger plan. This has been the best example of Toronto Council planning and Ford interference; coming up on 26 years, with no end in sight. Plus! I still don’t see any evidence that the CNE board has approved this little trolley line. Steve: This is city land. The CNE Board has nothing to do with it. In any event, the chair of the CNE Board is Mark Grimes who has been pushing for the Waterfront West LRT line to give his constituency, southern Etobicoke, better service to downtown. What an epic set of posts; thanks Steve. I can’t manage to wade through it all, and is/was this meant to ensure less ‘friction’ and more ‘efficiency’ by less scrutiny? Hope not, but trouble is there are shortfalls in most everything, and we were cut to 3 minutes, so part of me is kinda OK that the precious plans are being turned over, though Mr. Ford is perhaps poised to make all of Toronto just like Scarborough is now. I will vex about the east-west transit in the waterfront area from Mimico to core – I’d forgotten about all of this, and they split up the EA/study to make a wrong choice more palatable and then we’ll keep working on the real clunker – the access to Union, and surprise, it’s hugely costly vs. re-thinking what’s possible. Reading the 1993 WWLRT EA is worthwhile: two types of demand; milk run by the waterfront with lots of destinations and heavy commuter demand from pinch point of High Park etc. in through Parkdale in to the core. So TWO types of demand should have TWO types of service, but nope, won’t study that any further in favour of a road-based folly, the Front St. Extension, which never considered transit instead of the road, and had a lot of NDP support But there was a gem of a quick/good route in, and there was a massive budget but only for cars of course. We can’t have the TTC have competitive-to-Gardiner service with near-express routes, and we have this inferior WWLRT project that allows us to check off the box of ‘service’. By over-spending in Scarborough, we are blowing, or have blown again, a chance for better transit in a dense corridor, sigh. We need something that goes from King St. W, just east of Roncesvalles, over the tracks/road to southside to catch the Ex, and then back over again to be on north side just ahead of or around Dufferin. (Part of the reason to do this is to enable somehow the GO buses to access this RoW in to core). Then in to core using Front St. on surface. I recently realized in the last couple of years that since most everything is half-way done, why fight it, and think that way first, so there is thus a chance, or was, to have a reversible track to mimic much of the daily flows, and it would still be a huge help, vs. nothing. But a key part of the route, from Dufferin to Strachan was OK’ed to be a local road with support from Mike and Gord, and because nope, we don’t think of transit despite the DRL being on that same axis, we’ve let a set of large condos sprout up just east of Strachan in a tight bit of land, and this really may kill off any hope of quick surface relief in this decade. I was slow to realize just how easy the lowering of the Weston tracks made any crossing of them by transit; but we don’t do transit, and none of the core councillors seem to talk about Relief West, aka any type of subway.despite all the plans for something over the decades, sigh. It’s too logical a response to heavy streetcar demand, and again, why provide something faster when you have the Gardiner that consumes all sorts of gas and time. It’s sad because I suspect that the ‘fix’ for the entry in to Union will be excessively costly as it is lakefill, by the lake – but since the first part of this ‘fix’ was approved, the momentum is with the inferior, as per usual. At least there’s a definite funding crunch, so like the local Front Road, it won’t necessarily be happening, and maybe in another decade it’ll be less of Moronto and we will be smarter. And in the meanwhile, will we stop approving developments in Mimico and in the other places? Or will be sucked in to thinking that the Smart Track station is actually going to be an attractive service and worth those multi-millions. (I don’t think it’s going to be too good for the sums as how much of the demand is going to Union, really? And it’ll be hard to get to for many as the one easy access point of Queen St in the Dufferin underpass is Nasty). It still might be possible to explore having streetcars somehow use the strip of land to the north side of the GO tracks from Queen, or from King, over to Front St. and then use Front, but we are pretty happy selling out more local demand/service in favour of more regional. A possible way might be to stack the RER/GO trains atop transit, but that’s a further complication right? We sure do like letting buildings build our options shut, but I suppose lousy transit helps keep the core condo market booming. What’s happening with the Sheppard line? I keep seeing it on the plans as LRT, it was supposed to be completed in 2014…….but never any mention of it in upcoming projects? Steve: There are advocates of a subway on Sheppard including some members of Council and, of course, it was in Rob Ford’s subway plan. I was surprised that it was not mentioned as one of the province’s key lines, but we will see what they announce in their transit plans. Meanwhile, the LRT has never officially been taken off of the books, and so planners show it on maps, although the technology is sometimes vague. Yes, super frustrating no mention. I previously talked to Norm Kelly, previous councilor, & I know he was pushing for subway…as well current councilor Karygiannis has pushed for subway as well. We just want the damn thing (Sheppard) started….whatever it is. It was the first project before, but now seems to be last. In terms of Eglinton East, if 4,800 passengers per hour, about the maximum capacity we can expect to carry on an at-grade rapid transit line and have it remain rapid (assuming three car trains), are already expected to ride buses, shouldn’t we expect more people riding the train? How would we expect an at-grade to be able to carry all these additional people without supplemental express buses at peak periods a la 131E Nugget Express? Steve: 4,800 per hour on three-car trains is roughly 10 trains/hour or a 6 minute headway. If two-car trains, then 15 trains/hour or a 4 minute headway. There is still room for more. I’m also having a hard time comprehending how the Waterfront East and West lines will be able to share a single double-track tunnel under Bay and still be able to operate frequently enough to serve both lines without becoming stuck in congestion in the tunnel a la the current condition of 510 Spadina at Spadina Station. Steve: I have trouble believing the high end of the projected demand at 8k/hour when the number we usually saw for Waterfront East topped out at barely 4k decades from now, and Waterfront West will be even less. That said, the usual terminal screwing around TTC is famous for simply will not work at Union even with the extra platforms. Finally, while reading the Star today I learned that the new Relief Line will be a “light metro” that will carry 400,000 passengers per day, which given the abbreviated distance suggests a crowding level similar to the Bloor-Danforth line while presumably using rolling stock like the Docklands Light Railway or even the Scarborough RT instead of regular sized subway cars. Shouldn’t we plan these line so they are not filled to capacity on day 1? Steve: Please see my comments in the article on Doug Ford’s announcement about total ridership versus peak load.